Have you ever purchased a T-Shirt that can change someones life? Now you can. 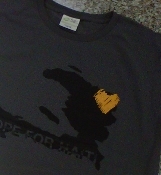 All of the proceeds from the sale of these T-Shirts will go toward the 40x40 Campaign. These attractive shirts are available in a special cut designed for ladies or a general cut for men.